Business processes need to be constantly improved and refined to keep up with the dynamic market scenarios. We are always on the lookout for faster and better ways to work and solve problems in our daily work. There are many tools used by business and consultancy for looking into their process and figuring out the best way to problem-solving. Some common tools used by most consultants are Root Cause Analytics, Porter’s 5 Forces, the BCG Growth-Share Matrix, The GE McKinsey Nine-Box Matrix, Porter 5 force analysis, SWOT Analysis and so on. When you are presenting a solution to your clients, you also want to convince them of the output and how you got there. The presenting part is easy, but what about the convincing part? Here is where the visualizing problem-solving in your PowerPoint presentations comes to play. Only facts and no visualizing can be mind-numbing. Especially when you are trying to convince a client to purchase your solution. How do you layout problem-solving visually? There is no one-way to visualizing problem-solving through your slides. Here at Chillibreeze, we work through the 3-levels of formatting to help our customers visualize something. Depending on the stage of the problem-solving, we pick the right visuals/approach to use. Sometimes it is a collaborative effort when we sit with our customers to get the best visualization solution for a slide. Are you Formatting Your Presentation to the Right Level? The attention rate is highest at the first and last 5 minutes of your presentation. The opening and the closing. Make the best use of that time. And here’s a little PowerPoint design tip: If you apply the 3 levels of formatting to your slides, apply level 3 to a few slides at the beginning and end of your presentation. 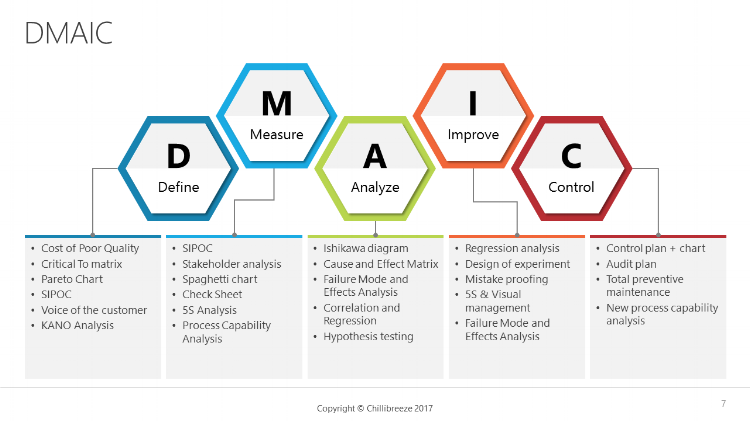 Here is a clean and perfect way you can visually communicate using DMAIC. Adding animation along with each process enhances the effectiveness of your message. 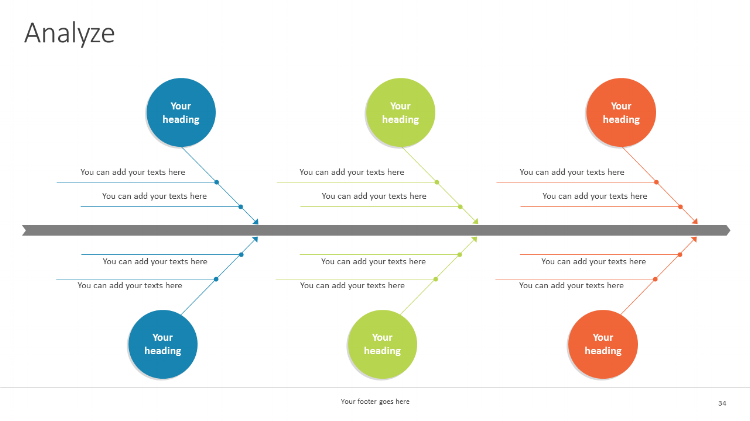 The layout depends on the depth of your content and the project type you’re handling. When you have a detailed structure of the whole DMAIC process having a navigation path is the best option. This way you can link the slides back and forth. If you are using a navigation path, replace the abbreviations with icons. Color coding the icons and the content that comes along with the process helps keep the flow. You can place the icons representing the 5 stages on the top corner of each slide or on the left-hand side and highlight them when the slides are talking about one or the other process. Now going a little deeper into each process. 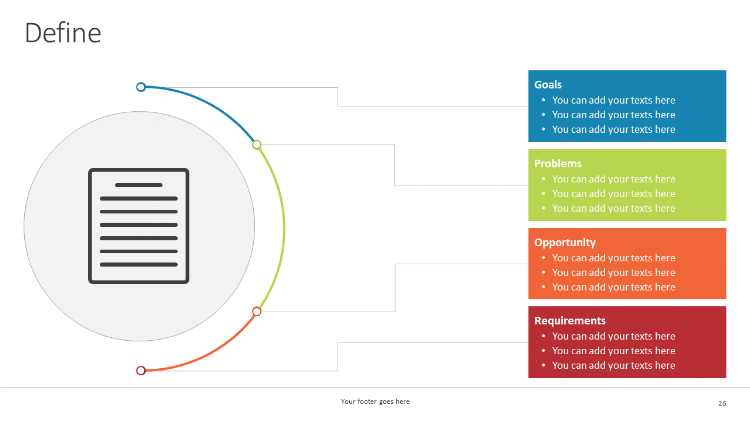 A process defining project goals, problems, opportunity for improvements and requirements. This can be visualized in the form of a workflow diagram or a process map. The best way to visualize the measure is through charts because they are mostly data based. Visualizing data can be challenging. 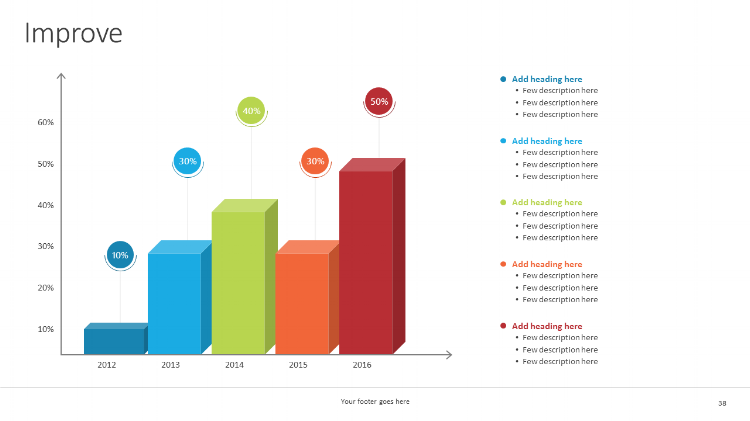 Use line or bar charts to visualize datas more effectively. 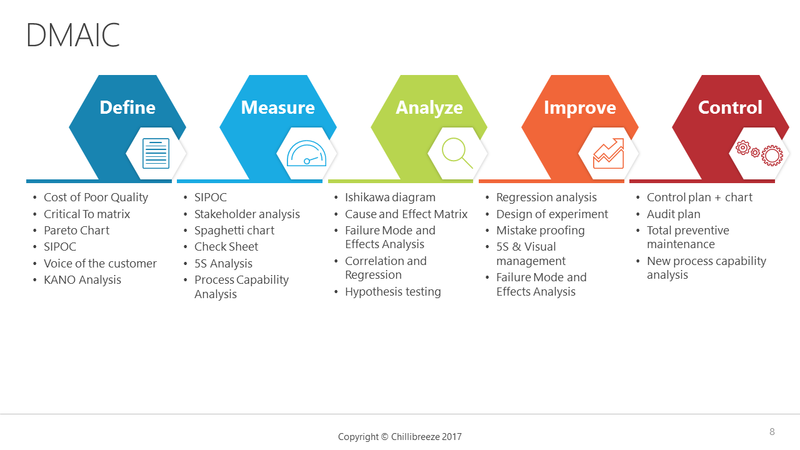 There are many ways you can visualize the analysis of your project. Like the RACI chart, maturity models, business cases, Pareto chart, scatter diagram, and so on. The common tool used for analysis is the fish bone diagram which identifies the causes and effect or problem. 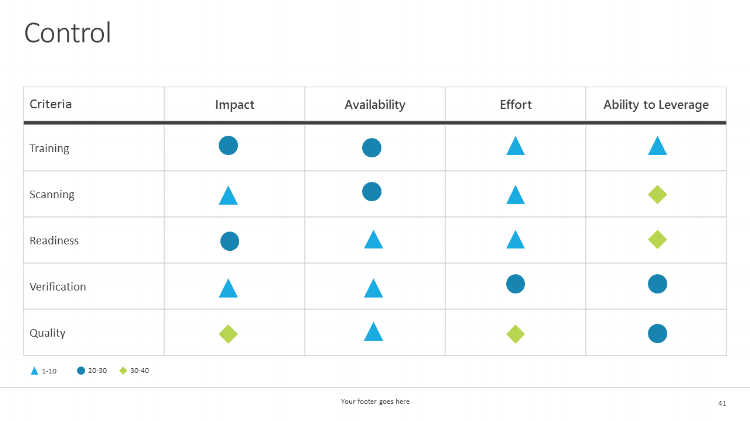 Counter Measure Matrix an evaluation tool, is a plain looking table that can bore you to death. Those ordinary looking excel sheets crunched with data and figures. But why stick to that if you can make it more appealing to the eye. A workflow or a flow chart is used to visualize Control. Every industry work in different ways and use various metrics, charts, and diagrams to present data. Some charts or diagrams might not work for certain types of data. Choosing the right format contributes to getting the data across. In addition, improving visualization helps us to think and talk creative. 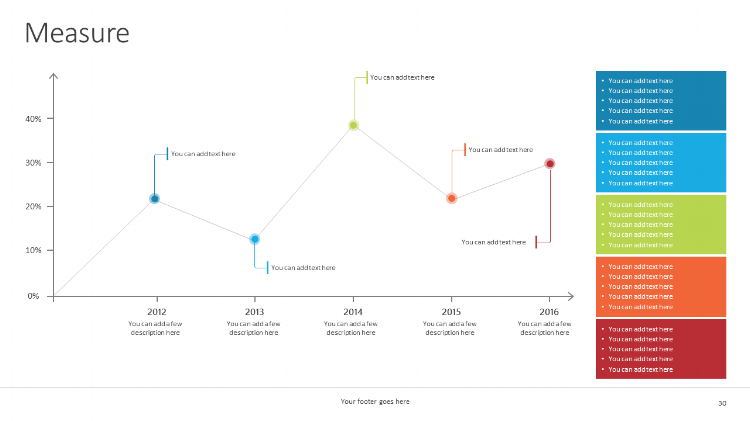 What tools, diagrams or charts do you use to visualize your data as a consultant?